Asian equities followed Wall Street’s gains overnight and edged higher on Friday while the dollar’s advance slowed ahead of the U.S. jobs report due later in the session. Spreadbetters expected European stocks to start flat to slightly higher, forecasting Britain’s FTSE to open unchanged, Germany’s DAX to start 0.2 percent higher and France’s CAC to open up 0.2 percent. The nonfarm payrolls report is the last before the U.S. Federal Reserve’s next policy meeting and may influence the timing of the Fed’s rate hike. 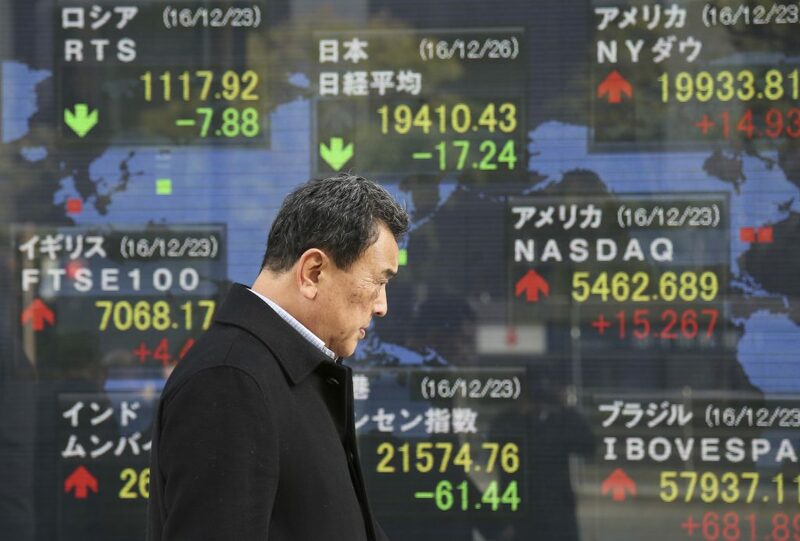 MSCI’s broadest index of Asia-Pacific shares outside Japan rose 0.3 percent. Australian shares added 0.2 percent while South Korea’s KOSPI and Japan’s Nikkei were little changed. Chinese shares gained after the private Caixin manufacturing purchasing managers’ index showed the country’s August manufacturing activity expanded at the fastest pace in six months. Shanghai was up 0.5 percent and Hong Kong’s Hang Seng rose 0.3 percent. Wall Street shares closed higher overnight as investors responded to strong economic data and drew some cautious hope from the Trump administration’s latest promises for long-awaited details of a tax reform plan. U.S. consumer spending rose slightly less than expected in July and annual inflation advanced at its slowest pace in more than one and a half years, diminishing expectations of an interest rate increase in December. The dollar’s recent advance slowed as rate hike expectations were dented. The greenback was up 0.05 percent at 110.030 yen having gone as high as 110.675 overnight, its strongest in two weeks. The euro was 0.1 percent lower at $1.1895 after plumbing a one-week trough of $1.1823 overnight. The financial markets looked to the U.S. jobs report due at 1230 GMT for further clues on the state of the world’s largest economy. Economists polled by Reuters expect U.S. nonfarm payrolls to have increased by 180,000 jobs in August after surging 209,000 in July and average hourly earnings to have increased 0.2 percent after rising 0.3 percent in July. “The wages component of the jobs report will be key. If earnings are to have picked up along with employment, we will see a straightforward reaction with U.S. stocks and yields rising and the dollar being bought,” said Junichi Ishikawa, senior FX strategist at IG Securities in Tokyo. The dollar index against a basket of six major currencies was steady at 92.716. The index slipped about 0.2 percent on Thursday and was poised to end 0.1 percent lower on the week in which it hit a two and a half-year low of 91.621 on geopolitical tensions before bouncing back. In commodities, crude futures fell, partly reversing sharp gains from the previous session, amid ongoing turmoil in the oil industry with nearly a quarter of U.S. refining capacity offline. Hurricane Harvey, which brought record flooding to Texas, has shut down at least 4.4 million barrels per day of refining capacity, according to company reports and Reuters estimates. U.S. crude futures was down 0.7 percent at $46.92 per barrel. The futures had surged 2.8 percent on Thursday following a steep drop the previous day, during a week in which the hurricane roiled the oil market. Brent crude shed 0.25 percent to $52.72 a barrel. Gold was near a nine and a half-month high, supported as the dollar came off its recent highs and by lingering concerns over tensions in the Korean Peninsula. Spot gold was slightly lower at $1,319.19 an ounce after rallying 1 percent overnight. The precious metal was on track to gain 2.4 percent this week, during which it touched $1,325.93 an ounce on Tuesday, its highest since early November. Other precious metals also enjoyed a strong week. Platinum hit its highest since March at $1,006.30 an ounce on Tuesday and last traded at $991.75. Silver hovered just below a two and a half-month high of $17.67 set on Tuesday.